When a filling is required, Lakewood Colorado dentist Dr. Matheson and his team can provide traditional amalgam and aesthetic composite fillings to prevent further decay. Composite fillings are closely matched to the color and shape of your surrounding teeth to simultaneous protect your tooth and provide a beautiful smile. These natural-looking fillings can usually be completed during one office visit and significantly improve the appearance of a tooth. Dr. Matheson and his team at Advanced Family Dental have chosen to make our office a “mercury-free” environment and no longer use amalgam fillings. Also known as silver fillings, these kinds of fillings have a few disadvantages over composite fillings. The metal of the filling can expand and contract, causing cracks in the teeth which can lead to additional decay and dental work. These kinds of fillings can also corrode and cause stains on your teeth and gums. If you have received fillings over the years, Dr. Matheson will closely monitor them for any signs of failure. At Advanced Family Dental, we pride ourselves and providing dental work that gives you the healthiest smile possible. Dental crowns look and feel like your natural teeth and are made from materials such as high-grade porcelain, ceramic, or porcelain bonded to gold. Fitting a crown requires two visits to Advanced Family Dental, allowing Dr. Matheson to get rid of existing decay, shape the tooth, and then fit the tooth with a temporary crown. On the subsequent visit, Dr. Matheson will remove the temporary crown, replacing it with a permanent crown that will be cemented into place for a new beautiful looking tooth. Overall dental health is threatened with tooth loss, which can be treated with a dental bridge. 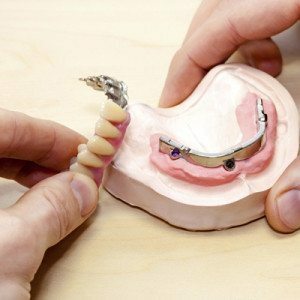 Placing a dental bridge will continue to provide the structure required to maintain the proper function of your mouth. Dental bridges can be made using porcelain, gold, or a combination of these materials. Used to replace missing teeth, a dental bridge attaches artificial teeth to adjacent natural teeth, called abutment teeth. 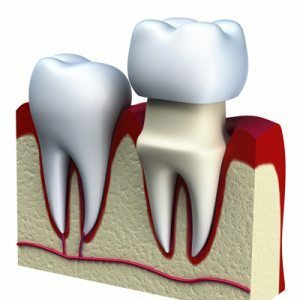 A fixed bridge involves the placement of crowns on the abutment teeth, or by bonding the artificial teeth directly to the abutment teeth. Fitting a dental bridge usually takes two appointments to complete at Advanced Family Dental. Dr. Matheson will take time to prepare the teeth on either side of the space and take impressions of your teeth to send to the lab in order to precisely construct your dental bridge. Between appointments, a temporary bridge will be provided to protect the teeth.